The History of the Tower of London is both bloody and cruel. 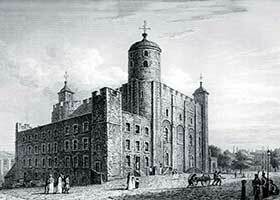 Which is why the Tower of London is considered to have the most ghosts and hauntings of any castles in England. The Bloody Tower, Traitors Gate and the dungeon called the 'Little Ease' provide an indication of some of the events which may have taken place in the Tower of London and what has led to so many stories of ghosts and haunting. To determine why so many ghosts are reputed to haunt the Tower of London perhaps we should first determine what exactly the definition of a ghost and why a haunting might occur. A ghost is often defined as the spirit or soul of a person who has remained on Earth after death. When Ghosts appear, they are said to appear in bodily likeness to living persons and often haunt their former habitats. Ghosts are believed to have a surviving emotional memory typical of someone who has died violently, traumatically and tragically. The soul of a ghost is not able to rest in peace and they remain in old and familiar places, repeating the same acts indefinitely until they are released from their endless haunting. Who were the Tower of London Ghosts? Why do Ghosts haunt the Tower of London? How many Ghosts haunt the Tower of London and which are the most famous? An obvious location where hapless victims were placed in a violent, traumatic and tragic situation. The people who were incarcerated in the Tower of London are famous people who played an important part in the history of England. Many were violently interrogated and tortured. Many were sentenced without a trial. Those who were executed had their lives ended with a violent, untimely and tragic death. Countless victims were executed on Tower Hill, just outside the Tower of London. Only seven people were executed inside the walls of the Tower of London on Tower Green. The seven people to be executed inside the Tower of London are detailed on the following list. Each of these famous people were killed by beheading. This barbaric form of execution was common in Medieval and Renaissance England and explains why so many ghosts are sighted in a headless state. Stories of ghosts incarcerated in dungeons explain the 'rattling of chains' and the terrified shrieks, groans, moans, wails and desperate cries of prisoners account for the noises associated with ghosts. Witnesses at the Tower of London have also reported 'anonymous' ghosts. These Tower of London Ghosts are simply referred to as the 'Gray Lady' and the 'White Lady'. Names which reflected the appearance of the apparition. The ghost of the ' Gray Lady' has been described as a woman in mourning garments. A black void is where her face should be. A phantom squad of ghost soldiers has also been sighted marching in the grounds of the Tower of London.